Kinhin is walking meditation. At the Hazy Moon, we perform kinhin in between periods of zazen, or seated meditation. Kinhin is a continuation of practice that also refreshes your legs after sitting and gives you an opportunity to exit and re-enter the zendo if needed. A period of kinhin lasts 10 minutes. It begins with a few minutes of slow walking and then transitions to a normal pace. 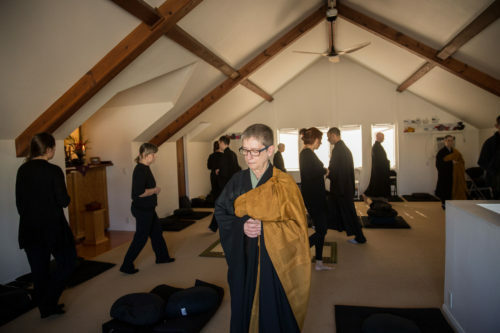 Kinhin is performed inside the zendo and is signaled with wooden clackers by the timekeeper. Kinhin is straightforward and is best learned by simply following along. During walking, hands are placed in the shashu mudra, clasped across the chest. We continue all of our practice admonitions during kinhin: eyes cast down, counting or following the breath or working on a koan. Kinhin invites us to maintain nondistracted awareness, or samadhi, while we are in activity. One ancestor gave this simple instruction for kinhin: Mind in your feet. At the end of a period of kinhin, we return to our seats for zazen.